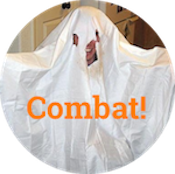 Further adventures in for-profit ticketing - Combat! Des Moines exactly as I remember it. Note: not Des Moines. A few weeks ago, we talked about various cities’ attempts to address revenue problems by selling private companies the right to operate and enforce parking meters. Around the same time, a St. Louis circuit judge ruled against American Traffic Solutions in a class-action suit, finding that the city had overstepped its administrative boundaries by selling ATS the authority to issue over $30 million in traffic tickets. Since 2007, ATS has operated red-light and speeding cameras throughout St. Louis, photographing license plates and sending the tickets to car owners using an automated system. Plaintiffs argued that this system violated due process, a claim that the judge largely rejected, although he acknowledged the possibility that ATS failed to notify ticketed drivers of their right to hearings. Ultimately, his problem with ATS lay with the state of Missouri’s complex and inordinately boring license points system—the ATS computers were not accurately reporting violations to the state Department of Revenue—but I’m going to take a flyer here and say that the Combat! blog audience is more likely to get charged with a crime than to administer the city of St. Louis. So we’re going to talk about that due process thing. Here’s how the ATS system works: in a psychosexual expression of their desire to be governed by robots, your city council votes 6-1* to install red-light cameras at local intersections. American Traffic Solutions operates these cameras and administers the system that serves drivers with citations, in exchange for which they get the ticket revenue. The city gets/saves a bunch of money by selling the job of traffic enforcement, which functions exactly the same except it’s run for a profit. Did you get a twinge at that last part? It is possibly a bad idea for the criminal justice system to work on commission, for the same reason it’s unpleasant to step onto a used car lot. You do not want the authority in charge of determining whether you violated the law to get paid every time you violate the law. That’s why in personal injury lawsuits, for example, the judge is not typically given a cut of the settlement. American Traffic Solutions has solved this problem by eliminating the judge entirely. Many of the myriad lawsuits against ATS center on their automated take-your-picture/mail-you-a-ticket system, which skips the part where you get to argue. In the same way that the automated checkout at the grocery store will periodically charge you $399.99 for a box of Triscuits, automated traffic systems sometimes send out a bunch of obviously inaccurate tickets. The tone of this article leads me to question its objectivity, but in Sioux City, ATS competitor Redflex ticketed approximately 500 drivers for running red lights on the interstate. After enough people complained, Redflex mailed each driver an apology, along with a ticket for speeding. Sioux City Police Chief Melvin William defended the legality of this move, noting, “Because in one spot we didn’t change the wording…the whole thing should be thrown out?” Before anybody could pull up the Constitution on the internet, it was revealed that he was asking rhetorically. This sort of argument—that drivers should just shut up and pay the fine, because they’re guilty of something—works much better when people don’t realize that they’ve been ticketed. Several of the country’s largest car rental chains have agreed to furnish renters’ credit card information directly to ATS, so that the company can charge red light violators’ cards automatically. Provided the driver is sufficiently careless about opening his mail and reading his credit card statement, it is therefore possible for ATS to issue citations and collect fines without any human awareness whatsoever. Perhaps I am only being sentimental, but there is something about an automated, for-profit justice system that would make Thomas Jefferson crap his breeches. In the scheme of a functioning society, traffic law is probably not that big a deal. Yet this situation is made particularly egregious by the same qualities that make traffic violations fairly minor. Given the sheer number of cars that pass through a city intersection each day, the frequency with which people roll red lights, and the near-universal habit of driving, selling companies like ATS the right to enforce traffic law via mass ticketing systems is suspiciously like selling them the right to collect a tax. It’s a great system for ATS, whose quarterly revenue growth broke 80% in 2008. It’s also good for cities, which get a quick cash infusion and are relieved of the hassle of enforcing their own traffic laws. The only people it’s bad for are, um, people. They get to pay money into a system that doesn’t convert their speeding tickets to schools and cops, and they get to be the revenue base for a business partnership between their government and a national corporation. But we’re definitely not talking about close cooperation between government and industry, because that would be a hallmark of fascism. 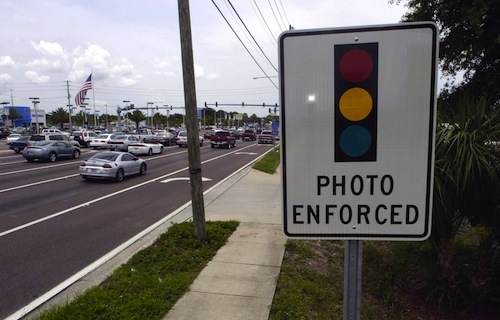 See, now, in a truly free-market system, ATS and Redflex would photograph the same intersection and give the violator a choice to pay whichever camera got the more flattering angle. Or, in a truly free-market system, there would be no traffic lights because no one should be forced to take turns. I have had the pleasure of posing for a traffic camera in Hannibal, Missouri (Mark Twain, anyone?). Because signs above the latest left turn lanes in Hannibal move more frequently than walnut shells in the hands of a carny, I decided to challenge the whole thing. The clerks of court in Hannibal could not tell me when any hearing would be held, if I chose to have a hearing. Living some 200 miles away and hoping to spend winter even farther afield, I paid the $134. This isn’t really evidence that private enterprise is inefficient or immoral. It highlights the difference between capitalism built from the ground up, and sudden privatization of an existing system.